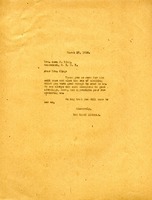 A thank you letter for the last box of clothing Mrs. Heath sent to the Berry Schools. 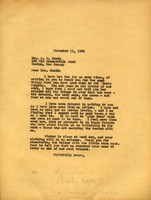 In this letter The Berry Schools thank Mrs. King for the box of clothes she donated for the Berry Schools. 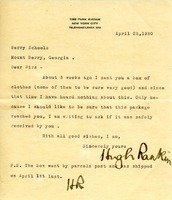 Lucy W. Parmly writes to Martha Berry to inquire after the box of clothing her niece, Mrs. Kielland sent. Mrs. Kielland is sick and is worried about the successful delivery of the clothing for "the poor people in the mountains," especially because she did not get the package insured. Lucy Parmly ends her letter by commenting on the unseasonable summer weather they are experiencing in Morristown, New Jersey. She hopes that Georgia is enjoying more stable weather. 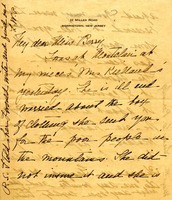 Note informs Miss Berry that Mrs Chas O Fad has died; it asks that her name be removed from Berry's mailing list, and says that Mrs Fad had collected a box of clothes before passing. 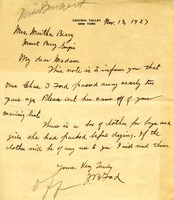 The author promises to send the box of clothes if Berry can use them.